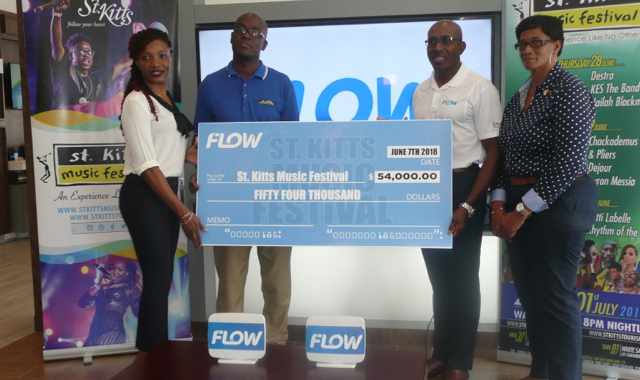 Telecommunications company FLOW St. Kitts & Nevis has continued it long-term partnership with the St. Kitts Music Festival with its Gold Sponsor donation. Chief Executive Officer David Lake said the company has been with the Festival since its inception. While he pointed out that he was personally looking forward to the Festival, he said FLOW was gearing up for the patrons. “The line-up is fantastic. A lot of activities are planned. FLOW, we have some good stuff planned, as well. Customers can look forward to some of our promotions, especially ‘The Phone of the Festival’, which we will be launching shortly,” Lake disclosed. Allister Wiliams, the executive director of the Festivals Secretariat, in the Ministry of Tourism, acknowledged FLOW’s relationship with the St. Kitts Music Festival. Williams also took the opportunity to encourage customers to get their data plans for the St. Kitts Music Festival.